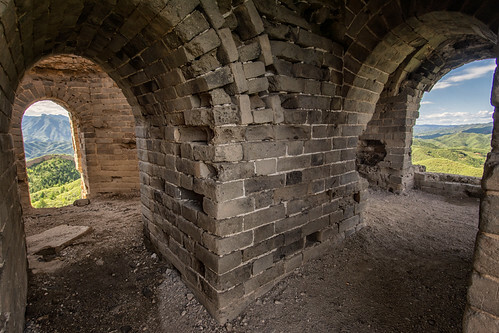 I decided on starting at the little visited restored section at Jinshanling and hiking the 25-odd kilometres of unrestored wall to the small town of Gubeikou out to the west. My guidebook had suggested this in the reverse, but as that would entail a roughly 1000 metre climb I figured my direction was better. 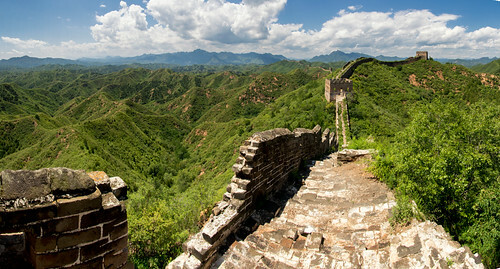 I also liked the idea starting with the restored, walking the wild wall and finishing where there is no tourism at all. 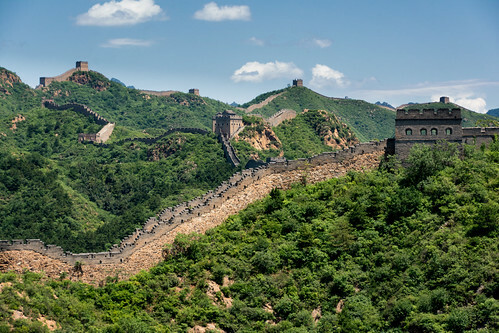 The Great Wall has many faces, rather than a single continuous unbroken line that the typical image conjures. In some places it splits, others it simply terminates, and others yet where it forms several lines of defence, all built over more than a millennium. It exists as little more than a mound in some places, to crumbling overgrown ruins, to full on Disneyland fantasia complete with go-karts, chairlifts, teeming masses and devoid of a single original brick (such as at the infamous Baudaling). 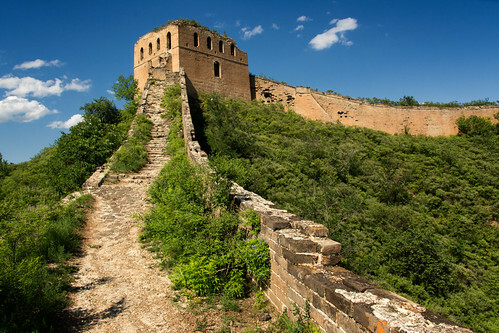 I arrive at the wall at Jinshanling to find it virtually deserted despite being peak season. It’s built along a steep sided ridge and disappears off to the east up a near vertical stretch of mountains with some amazing views around. The restored section is interesting and gives an imposing idea of the wall in its original state, but for me it lacks any of the feel of the history of the place. After a short while exploring this area, I turn west and soon find myself completely alone on increasingly dilapidated wall – worn bricks, ruined guard houses, bushes and trees growing from every crevice. Wild hillsides stretch out in from both sides with only the hint of distant farmland. 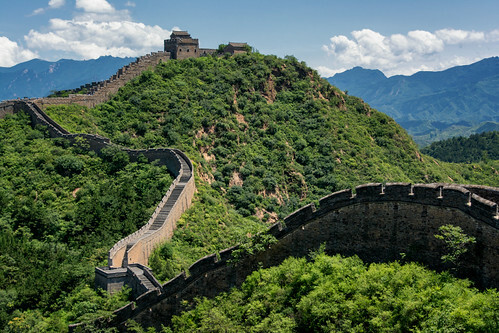 This is the perfect Great Wall experience I was hoping to find, happy not to be having to share it with 80,000 selfie stick wielding throngs at the popular sites. After around an hour or so, I reach a section closed off due to a military zone butting up to the south side of the wall. Looking in to the area I’m not allowed to be looking in to, all I can see are pine clad valleys stretching off as far as I can see. Maybe these are top secret military grade pines that they don’t want the rest of the world to find out about. Instead of continuing on the wall, there’s a 90 minute track to follow to the north with rolls through scrub, forest and a patch of farmland before climbing back up and continuing west. It’s interesting to see it from the perspective of the approach would be invaders would have had. Good luck scaling that beast with heavy armour and cavalry. 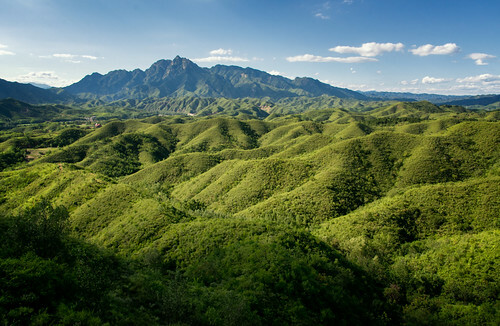 The wild and desolate landscape, combined with being completely alone along this stretch (I haven’t seen another soul since leaving Jinshanling) make this an incredible experience. 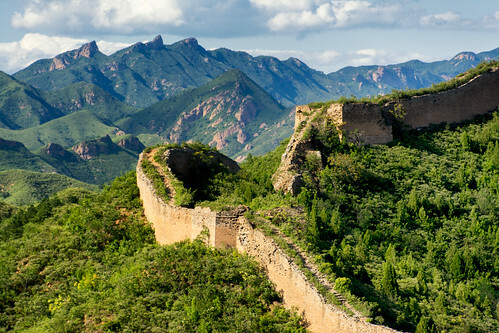 Eventually the wall spills down into the Gubeikou valley and begins a long rambling descent with views across the valley to the wall climbing an impossible peak across the river. 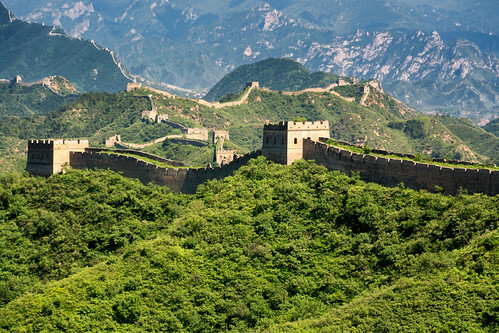 Closer to town, the wall has suffered centuries of being used as a cheap source of building material. The wall dwindles to a long hump before disappearing altogether above town. I end up in someone’s backyard much to their surprise and mine. 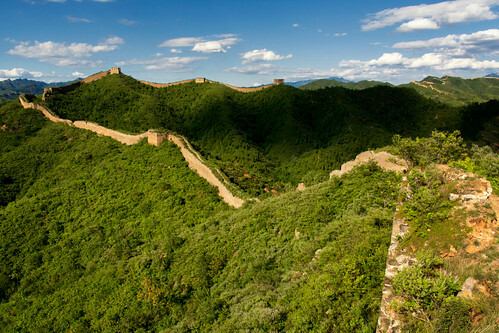 Very impressive photos of some less traveled parts of the Wall! 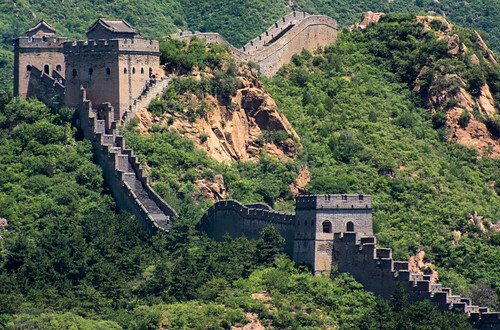 On a windy day, those sections of the Wall are very difficult to climb. Do you plan to do more sections?